Categories: Poems, quotes and music | Tags: Bordeline personality disorder, BPD, difficult therapy session, god and therapy, poetry, prayer, therapeutic relationship, therapy | Permalink. This weekend my therapist is at a residential conference – strangely enough at a conference centre I have stayed in myself. I have been dreading this weekend for months, remembering how I felt last time she went to a similar event. I have been dreading the feelings of exclusion, of jealousy, of knowing that she will be interacting with strangers who for these three days will have a greater insight into the minutiae of her life – what does she have for breakfast? – than I will ever have. They will be in company without the company of the clock; they will talk and laugh uninterruptedly; they will take a walk and talk – or not. They will capture the moment, in a picture. Oh to be a fly on the wall and to be able to observe her interacting in a carefree way with those around her. And yet, I know the irrationality of my fears and hopes. I have a very different – the opposite of care free – and more valuable kind of access to her than most of them will ever have ; and being a fly on the wall would be unbearable for precisely that reason. I’ve never had to ‘share her’ – I wouldn’t want to have to try. After this, we only have two more sessions before a two-week Easter break, and I was worried we wouldn’t have time to process the fall-out from this weekend. Yet somehow, as always seems to happen, we have arrived at the point just before the break – despite my fears over this weekend – with a lovely sense of security and connection. It’s been an incredibly difficult few weeks, and I have found myself treating her in ways I have hated myself for. I have caused her to feel coerced, manipulated, and intruded upon; she’s had to wade through the mire of counter-transference and my resistance. But she is my therapist – and she continues to amaze me and to show me, through her example, what love really looks like. What has struck me deeply, through all of this, is that she keeps on giving. She holds the space; she holds firm against the resistance; we work through the pain, the tears and the tantrums (all mine). But she keeps on giving, and she does not withhold. Yes, she withholds therapeutically, for the benefit of the work, but she does not withhold of herself in retaliation. I am so used to the tautology that misbehaviour equals punishment; that resistance leads to consequence; and that if I try and ‘win’, something will be taken away and lost. It’s why, each time she shows me her unwavering nature and her generosity, there is always the internalised voice that says ‘this time….this time, I have really blown it, she will never be the same with me again, a part of her is lost to me’. But every time, I’m wrong; and I’m so thankful that I’m wrong. There is no retribution; and she doesn’t see herself as wronged. She knows me, and that whatever mess I bring from one week to the next is only part of me, and not the whole. She cares for the whole, and reminds me that it is there, even when I have forgotten. She responds to what I bring – without bringing up the past and without conditionality. She gives, as if I’d never tried to take what wasn’t mine to have; and that is both humbling and overwhelming. The night before she left I sent her a brief email saying I would miss her, and I wished her an interesting time and an enjoyable walk around the gardens (replete with poems and quotes hidden amongst the trees). I also said that I hoped a poem or two might come out of this weekend – it’s been my way, recently, of trying to cope with difficult or intense emotions. 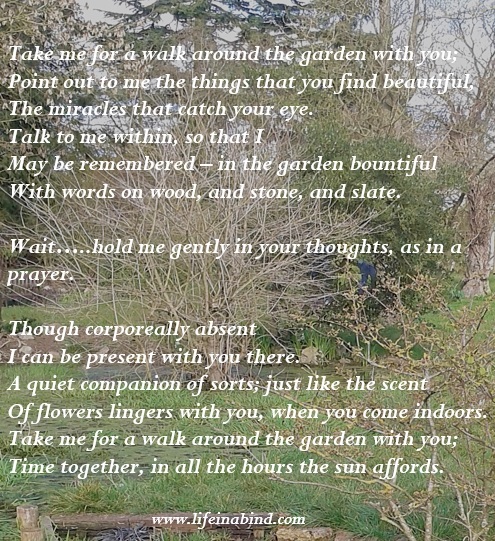 I didn’t think I would receive a reply until after the weekend, but she wrote back saying she would think of me at the house and in the gardens; and she shared something (a poem and a picture) of the material she would be thinking about over the weekend. Her giving was a wonderful and deeply touching surprise. She included me, when she knew I would be feeling excluded; and she told me she would think of me, when she knew I would worry about being kept in mind, when she had so much on her mind. 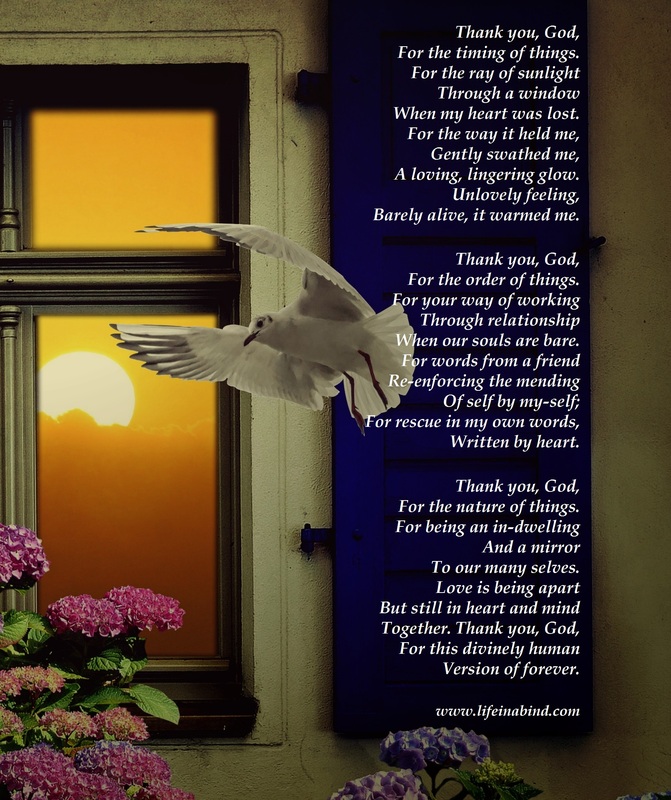 And so I have drawn together my thoughts and feelings into a poem; grateful for her giving, trying not to dwell too deeply on the missing, but reminding myself of what I have. I have tried to capture a lessons in love – a moment of being together at a distance, in a picture of words, timelessly unhampered by the clock. Categories: Poems, quotes and music, Therapy | Tags: being kept in mind by therapist, borderline personality disorder, BPD, giving and not withholding in therapy, love and giving, missing therapist, poetry, therapeutic relationship, therapy, therapy and unconditional love | Permalink.